From New York City to Los Angeles, America's greatest cities are home to some of the world's most breathtaking works of art. No, we're not talking about masterpieces housed in museums like the Met or the Getty, though they are undoubtedly beautiful in their own right. We're talking about the impressive feats of visual splendor plastered on the empty walls and underpasses of your hometowns. We're talking about street art. Street artists have been breaking up the monotony of urban meccas for decades, beautifying the bare spaces of the public realm with their particular brands of color and design. Instead of oil paint or marble, artists like Shepard Fairey and Swoon reach for cans of spray paint, wheatpastes and stencils, proving masterpieces exist outside the halls of fine art galleries too. While it's true that many cities have encountered their fair share of conflict with graffitists in the past, American audiences have largely embraced the world of open air art. From major museum exhibitions to the celebritization of street art stars, the genre has become a welcome form of ephemeral creativity and artistic innovation. It has its own community of experienced critics and scholars, like the experts at Brooklyn Street Art, Jaime Rojo and Steven Harrington, who write regularly about the "the power of street art to reface, re-contextualize, re-energize and re-imagine a building and its place in the neighborhood." In celebration of America's thriving subculture of street artists, we've compiled a list of the greatest art that can't be found in a museum. Whether they're temporary or permanent, penned by an anonymous maker or a household name, behold: the stunning artworks lurking on the corners of U.S. cities. 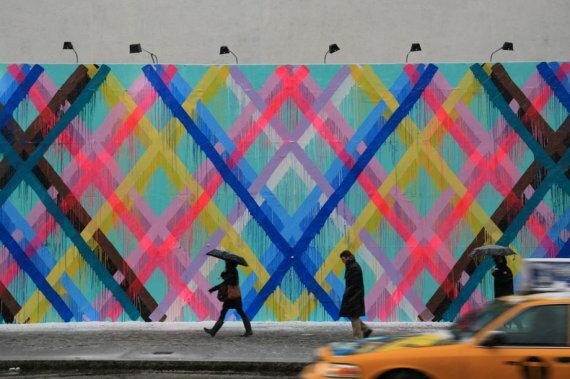 Alex Brewer, aka Hense, covered a former church in a multi-colored mural in 2012. Correction: A previous version of this article stated that the Wynwood, Miami mural was created by Entes y Pesimo, but it was actually painted by Entes and street artist Jade Rivera. The caption has since been updated.